We are the largest supplier of Rotating Mast Aerial Platform / Folding Work Platform. Free standing: Up to 18 meters. Free standing : Up to 18 meters. Max Height with Tie-Ins: Up to 100 meters. 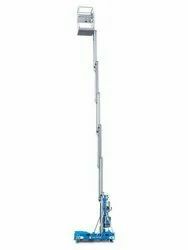 Max Height with Tie-Ins : Up to 100 meters. With the assistance of our talented team of professionals, we are providing a high quality range of Double Mast Aerial Work Platform. We are offering Aerial Trolley to our clients. From scissor lifts to virtually most aerial lift applications, you can count on Trojan Battery to outperform the competition. We are a manufacturer of all kind user required aerial platform. We supply Truck Mounted Aerial Lifting Platforms. Unit is made in India and fix on indian trucks, TATA ACE, DOST pick up. We also supply & Install imported aerial lifts from Italy. We have been fulfilling the varied needs of our valued clients by offering them a faultless gamut of Self Propelled Aerial Work Platforms. The offered Aerial work platform is developed from optimum components and latest technology and is tested suitably by our professionals. We are engaged in manufacturing the fine quality working platform with high weight bearing power and known for their best functions and superior strength. Our platforms are highly mechanical and provide desired result of the users. They are generally used for temporary, flexible access purposes such as maintenance and construction work or by firefighters for emergency access.